The May Day Mystery refers to a series of cryptic ads which have been placed in the Arizona Daily Wildcat, the newspaper of the University of Arizona, every May 1 since 1981. The mysterious ads have appeared on other dates as well, and often in December. While the ads at first appear to be an intellectual game or puzzle, it has been suggested they actually cover a deeper meaning. 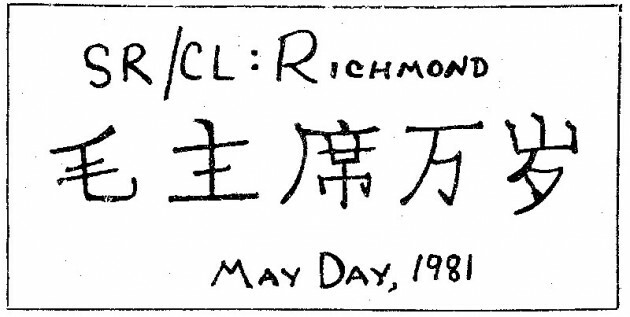 The first ad that is still recorded (above) was published in 1981, contained three handwritten lines: “SR/CL: RICHMOND”, a string of Simplified Chinese characters, and “MAY DAY, 1981”. The Chinese characters translate literally as “Chairman Mao ten-thousand years old”, which is usually interpreted as “Long live Chairman Mao”. In the late 1990s a young reporter named Bryan Hance who was working for the Daily Wildcat noticed the weird ads posted in the paper… a full-page one on May 1st, along with smaller ads posted throughout the year. After a number of years of seeing these strange ads, Bryan started to investigate the mystery. He looked into past editions of the Daily Wildcat, and found the strange ads going back as far as 1981, but archive records only existed from 1981. It is possible theymay have gone back even later, even as far back as 1973 according to some. 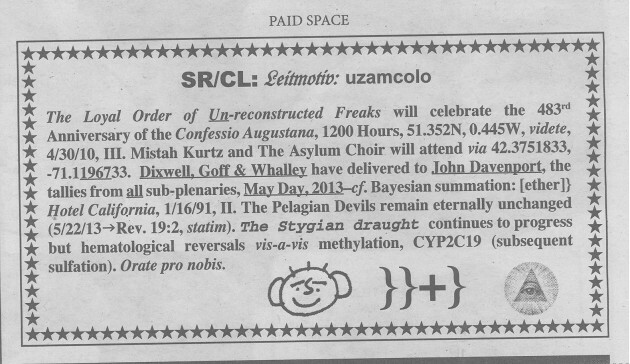 Those behind the ads – The “freaks” and the “orphanage” would communicate directly with Bryan. They mail him notes and clues. The reporter has documented it all on his website, themaydaymystery.org and a ever growing community try’s to analyze the ads to reveal the true meanings. The complexity of the puzzles are also mindboggling, they include cryptic historical references, symbology, rare and ancient languages as well as complex mathematical calculations. The mystery is still running! Over the years a number of strange and recurring themes occur!